Feather plucking is one of the most common behavior problems affecting this particular type of conure, as well as other varieties including the nanday conure. Just as the name of the behavior suggests, the bird plucks out its own feathers one at a time. If the behavior continues, you could end up with a bird lacking feathers and a mess all over the cage and floor. Another problem that sometimes occurs is screaming. Before you pay the jenday conure price, you need to realize these are not quiet birds so be prepared for noisy vocalizations even under the best of circumstances. In some cases, the bird will scream to get attention, and this can become very annoying very quickly. Finally, once the conure reaches sexual maturity he could begin biting. Biting is not common among the jenday conure but can happen and must be dealt with quickly to avoid serious injury. 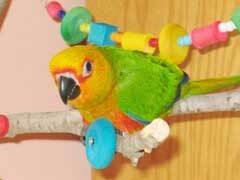 The good news for anyone interested in a conure parrot for sale is that these problems can be avoided. These problems are usually caused by boredom. When a smart animal doesn’t have anything to occupy themselves, they resort to being bad. The same thing occurs with any intelligent animal, including humans. You can keep them stimulated with toys and trick training. As long as they have something to do, they usually don’t develop these negative behaviors. Also, spending time daily with your bird is going to be important. If possible, you should place their cage in the part of your home where most of the activity happens so they feel like part of the family. As any jenday conure breeders will tell you, preventing these problems is much easier than trying to solve them once they occur. If you are looking to welcome a beautiful jenday conure into your home, make sure you are ready to deal with the ups and downs of sharing a life with such an intelligent bird.